A valuable opportunity to learn from a seasoned professional / senior executive at personal level that you can't afford to miss! To enhance the exposure of CUHK students through experience sharing and interaction with experienced professionals and senior executives. build up networks for future development. 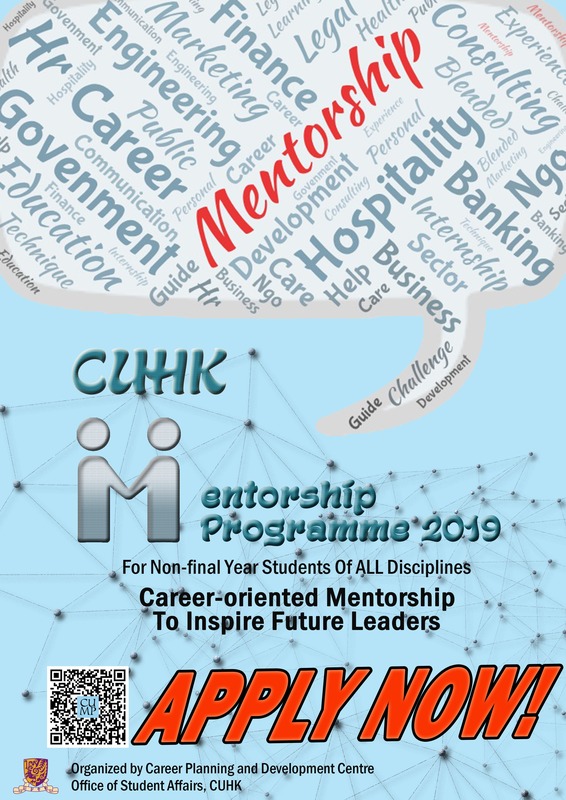 Through the mentorship, mentors would inspire students with real world experience at personal level, thereby grooming future leaders for the society, setting a role model for the young generation and shouldering personal social responsibility by contributing to the Hong Kong community. In addition, it is considered that the mutual exchanges between mentors and mentees provide a platform for the mentors to better understand the younger generation and their life and other values so as to have a better view on ways to attract the right talents and stay young at heart! From diverse fields including banking / finance, consulting, education, engineering, health care, hospitality, HR, IT, legal, marketing, NGO, public sector, etc. Full time CUHK non-final year undergraduate students and postgraduate students with graduation after December 2019 from all disciplines are welcome to join. While no specific rules are in place, the mentors and mentees are encouraged to meet at least four times throughout the year, apart from regular phone / email communications, so that the objectives of the programme can be fulfilled. To facilitate the mentees to reflect what they have gained from the Programme, mentees will be asked to submit a short quarterly report. Mentors and mentees are always welcome to share with us their mentorship experience and remarkable moments from time to time. Successful applicants will be notified by the Career Planning and Development Centre via email by November/ December 2018. Applicants who do not receive any email notification by the end of December 2018 may consider their applications unsuccessful. For enquiries, please contact 3943 7202 or email to cpdc@cuhk.edu.hk. Copyright 2019, OSA of CUHK, All rights reserved.